If you are in Nepal it is most always about the view. Trekking for days just to get that view over the Himalayan mountain range or to see the sunset rising beyond the snow covered peaks. That’s what we were after. 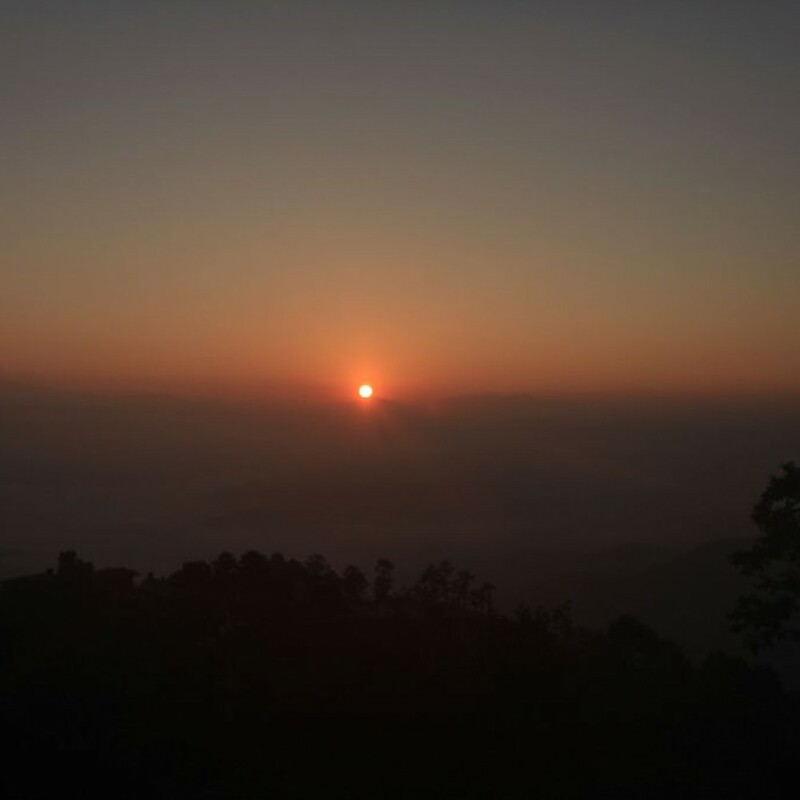 A friend told us that Nagarkot is a popular place to go if we wanted to see the sunset. Nagarkot is not far from Kathmandu, about a days drive with motorbike. So we decided to make a stop in Bhaktapur on the way, stay there overnight and do some sightseeing in Bhaktapur before moving on to Nagarkot. The driving from Bhaktapur is spectacular. Curly, narrow roads going uphill all the way with a view over the entire Kathmandu valley. In good weather conditions you could probably see all the way to Kathmandu. It is a dangerous road though. Not so dangerous according to Nepalese standards but for foreigners on their own motorbikes you need to be cautious in the turns as there are lots of small local buses and tourist Jeeps that goes up and down this hill. Not all of those are cautious. As we entered the town, or village, of Nagarkot we could tell why this is a popular destination for mountain views. You literally have a mountain or mountain range where ever you turn. Looking for a place stay in Nagarkot can take some time if you haven’t booked in advanced. Even so, we do recommend that you choose your accommodation on site. All hotels brag about their mountain view. But when you actually get there you might feel a bit ripped off if you picked the wrong one. You see, all hotels in Nagarkot have some sort of mountain view. But many of the rooms and hotels we looked at had big trees in front of the windows, big electrical cords blocking your chance of a good photo opportunity. Either that or the hotel was faced towards the Kathmandu valley. Still a view but maybe not the view you would drive a whole day or two for. So after driving past the village center onto a narrow road and more uphill we found a few hotels hidden away that had the view we were looking for. They had the mountain range and we were told if it was a good day the next day we would be able to see Mt. Everest in the distance. So the next morning we woke up early before sunrise. It was cold. So cold we could almost not take it standing outside in the dark waiting for the sun. We could see a faded light behind the mountain range as we stood on the roof of the hotel. It was beautiful. The mist and fog covered the whole valley under us and the mountains started to take shape before our eyes. The big orange ball of sun came up quickly and shed a pink, orange and yellow light over the valley, lightening up the mist and fog. The snowy peaks appeared and it was magical. All the freezing outside and waking up that early paid off. We didn’t see Mt. Everest, in fact we did not see that much at all except the first and closest mountains of the mountain range. But it really didn’t matter. It was magical and something we will never forget. The same day we checked out and headed towards Godavari. Nagarkot is really about the view and we didn’t really feel we had much left to do here. But we would recommend it to anyone. Nagarkot proved to be a place worth a visit.